Today we will be sharing Easy Spring Recipes. Springtime for me has always screamed Rhubarb! Each spring my sister Joan and I would wait patiently for the rhubarb to peek through the dirt. Aggie would let us know when the rhubarb was ready and we run to our rhubarb patch, located in the far corner of our backyard. We’d pick the largest stalks of rhubarb we could easily pull from the ground. Then we would run to the side of the house and wash off our stalks under running water from the green garden hose. Joan and I would sit on the front porch, dipping fresh picked rhubarb stalks into small bowls of sugar. Aggie always made this recipe for Oatmeal Rhubarb Bars during the spring months when rhubarb was plentiful. Aggie also made rhubarb sauce and for breakfast I would have rhubarb sauce over toast. Sweet, Tart, Delicious Rhubarb, The Classic Springtime Favorite. For filling: In a medium saucepan combine rhubarb, the 1 cup granulated sugar and water. Bring to boiling; reduce heat. Cover and simmer for 5 minutes. Meanwhile, in a small bowl combine the 1/2 cup granulated sugar and the 2 tablespoons flour. Stir into rhubarb mixture. Cook and stir about 1 minute more or until thick. Remove from heat; stir in vanilla extract and lemon zest. Set aside. In a medium mixing bowl, combine the 1 1/2 cups flour, oats, brown sugar and baking soda. Using a pastry blender, cut in shortening until the mixture resembles coarse crumbs. Stir in 1/2 cup pecans or walnuts. Reserve 1 cup of the crumb mixture. Press remaining crumb mixture into the bottom of prepared pan. Evenly spread rhubarb mixture on top. Sprinkle with reserved crumb mixture. Bake in a 375 degrees oven for 30 to 35 minutes or until the top is golden brown. Cool on a wire rack. Cut into bars. 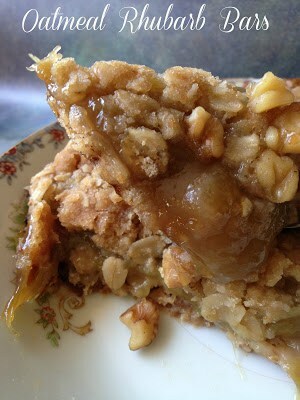 I love rhubarb and can always use more recipes! Rhubarb – the quintessential spring fruit – PERFECTION! I just love these bars and I bet the flavors are outstanding! Yes, this is one of our favorites. This recipe is nice and easy. The filling is just right too. Always in the market for rhubarb recipes and this one sounds fabulous. 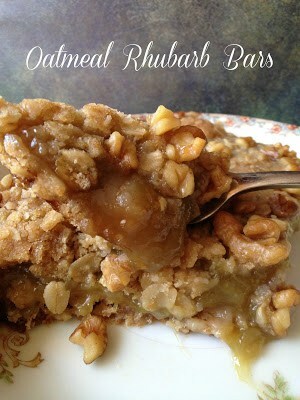 This is the perfect way to present rhubarb in these lovely oaty bars, I bet they are delicious. How wonderful to have grownup with a rhubarb patch inn your backyard. 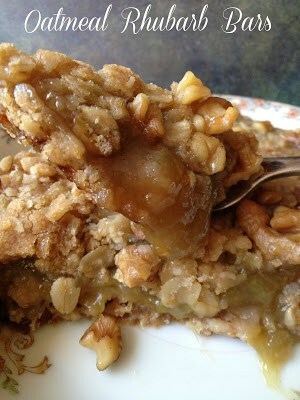 My mom made so many delicious things with rhubarb. it's great. Nice and fresh. Exactly. My husband does exactly the same thing…dipping a stalk of sour rhubarb into sugar. I have to admit, it's delicious. Nothing says spring like rhubarb. My plant is totally out of control. Your so lucky to have a rhubarb patch!